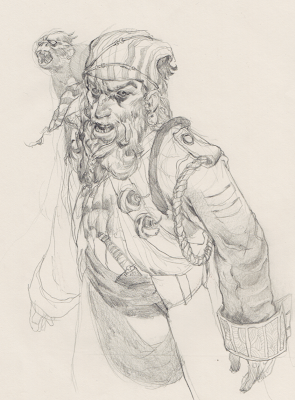 Possible pirate piece in the pipeline. I did this sketch as a sort of warm-up to get excited for it. I may come back and paint this one up like yesterday's. Not sure if I want to make it a lighting study, or just to move on. I said possible though, because I also want to do a conquistador piece. It has to be a brighter looking piece, but i can't get away from the burial of a conquistador with his gold. I DON'T SEE ANY CANNON FEET, MIKE! WHY BOTHER DRAWING A PIRATE IF HE DOESN'T HAVE CANNONS FOR FEET?!?! OH GOD. WHAT HAVE I DONE?! It would seem that I forgot a lot of the detais of our captain. That one seems pretty important.